It’s official. I finally have a friend who’s having a baby boy 🙂 I’ve been thinking of baby gifts for their little one and I wanted to make something football related. They are both into football, though divided (she likes the Cowboys/he likes the Redskins). Classic huh? Since the baby is due in the colder months I though a football blanket would be quite appropriate. And what better than one made out of super soft and warm fabric? 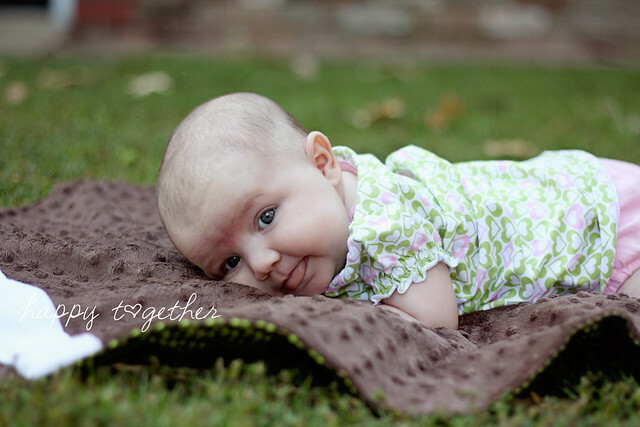 I used my daughter to model the blanket so you could see the perfect size for a little one this is. 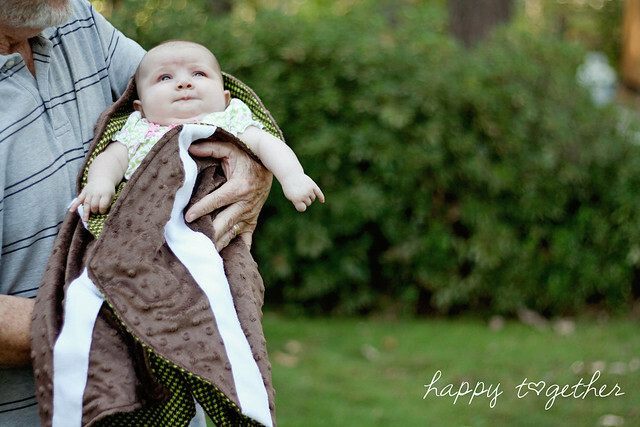 The shape makes it really easy to wrap around the baby too. I can just imagine a mom at a football game with little one all wrapped up in one of these with the underneath side sporting a fabric with the teams colors. It could also be used as a play mat. Good size and super soft. 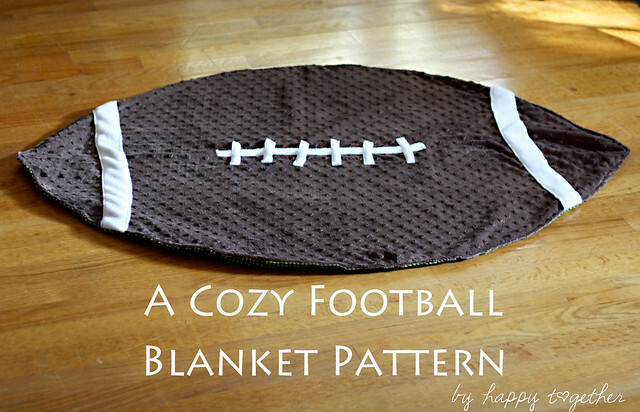 The pattern is for this smaller size, but you could easily create an even bigger one for the older football fan in your life. Let’s talk about fabric real quick. For the top, I wanted to use some of that minky fabric (this kind is minky dot fabric). I found this brown at a local fabric store. You could use fleece or flannel or even regular cotton fabric if you like. For the bottom, I used a cool green/brown hounds-tooth. But, I think it would be neat to find a print of the parent’s favorite football team or something like that too. I didn’t do that because their house is divided in its allegiance. -Appropriate sewing needle (I found that out of all the sizes I had, the size that worked best was an 11(75) for medium weight fabrics). *Tip: The minky is a very slippery fabric to work with and the fleece can be really stretchy, so make sure to pin things down really good or even try using an iron on adhesive (like heat n’ bond) to “stick” the fleece onto the minky first then sew it on. The odd number pages are at the top, the even ones are on the bottom. Match up on the dotted lines and tape together. 2. Lay the 1 yard of minky down flat. 3. Fold in half long ways. 4. 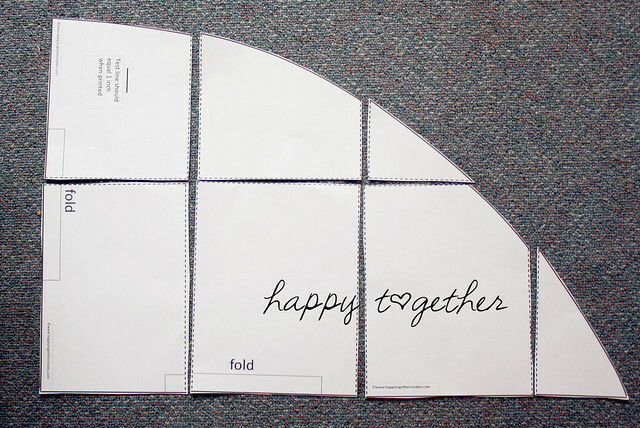 Fold in half again, so there are now two folds. 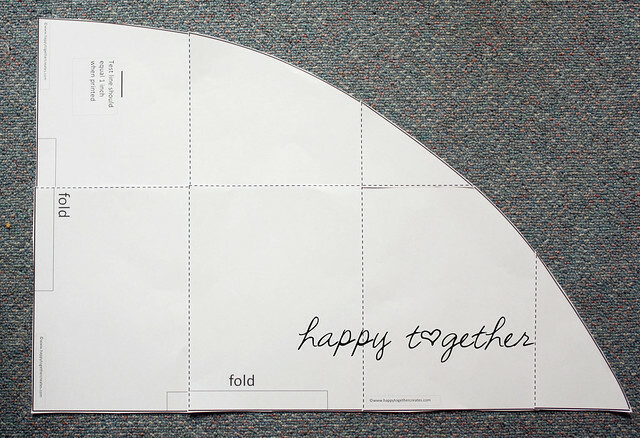 Place pattern piece on so the two sides marked fold are placed on the fold. Cut out of fabric. 5. Repeat steps 2-4 for the bottom fabric you chose. 7. Place the 23″ x 1.75″ seven inches in from the side. Pin in place. Put the long middle piece in the exact middle of the middle with the 6 little pieces evenly spread out on it. Pin in place. 8. Sew the fleece in place. 9. Now place the top football on the floor, right side facing up. Then place the bottom fabric on top, wrong side facing up. Sew the two pieces together, leaving an opening for turning right side out. 10. Turn blanket right side out. Turn in edges of where the opening was and pin in place. 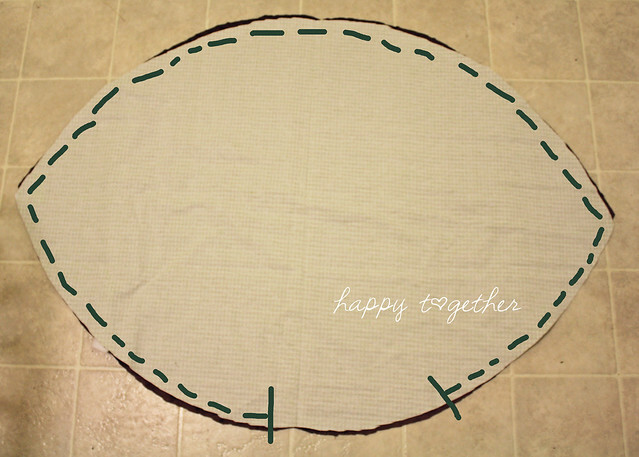 Then sew around the edges of the whole blanket. I didn’t sew over the white though because I didn’t want the brown thread to be seen there. You can do that if you like or even go back over those parts with changing the top thread to white so it isn’t seen. What a great idea! My son’s room is Steeler’s themed, and I wanted to make him a blanket to match. I might be making one of these very soon! 1) This is really great, and a fantastic idea! 2) All my friends have been having boys! Now I might have something awesome to make for them that’s really different! This looks so soft and cozy! My husband would like one of these in a much larger size! Ohh I might be making one of these for my little girl…. and then for my toddlers too. LOL I would have to make them Green Bay green and gold and Bears (yuck) brown and whatever color they are. 🙂 Thank you so much for the amazing pattern! Oh.my.CUTE! Two of my good friends are pregnant, so if either of them are having boys, they will be getting one of these. 🙂 Thanks for sharing!! Jess, this is awesome! I love the blanket. Thanks for the pattern and the tutorial. Great design – thanks for the pattern! What a fun idea! I think I might have to make a big one for tailgating. Love it!! I have been meaning to change the little blanket I have on the back of the couch to something more appropriate for Fall and this will be perfect! A little tip I heard about working with Minky fabric is to use your walking foot. It feeds it through evenly and makes it 1000x easier. Oh my gosh I LOVE this! 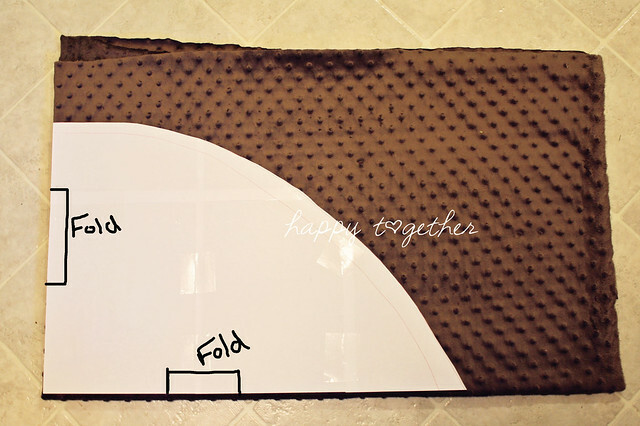 I am having my third boy in February so this is perfect 🙂 AND I happen to already have a “team” fabric and the white so all I have to get is the minky brown – win! Love this pattern! Can’t wait to make one! Love your blog!!!! So cute! This is too fabulous! We’re expecting #4 in January and my husband LOVES football! I’m going to make this, hide it in my bag for the hospital, and then surprise him with it after the baby is born. This is going to be such an awesome gift for ‘Daddy’! This is so adorable Jessica! What a great idea. I am making my son one of these for Christmas. Thank you for making this pattern! Now to decide on which team to put on the back. My hubby’s team or mine! Just made one of these, so cute. Can’t wait for my son to use it. Thanks for a really great pattern. Visiting from Ucreate. This is ridiculously adorable! Thanks for the pattern!!! I can’t wait to do this, but instead of using heat and bond I would use spray adhesive. I love that stuff! It is much quicker then heat and bond! 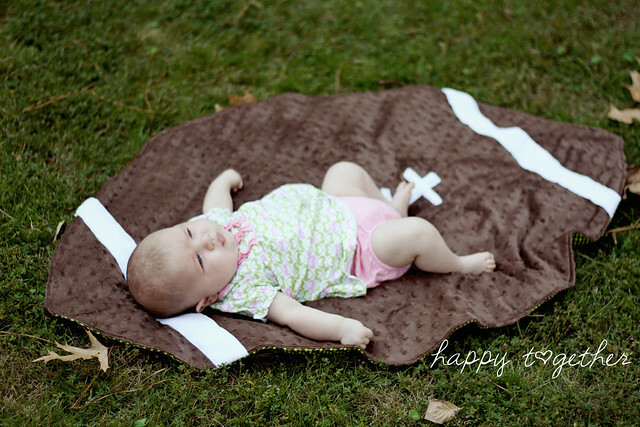 Love this blanket! I really want to make one for my friend who plays high school football, but do you know how I would go about doing that?! Like with the pattern and all or even how much fabric I would need to get!? I would suggest maybe using a brown fleece blanket and a sheet (either cotton or flannel). With it being winter, you should be able to find those for a good deal. I think Walmart even usually has solid color fleece blankets for cheap. Try to make it a bit more of a rectangle to mimic more of a football shape. 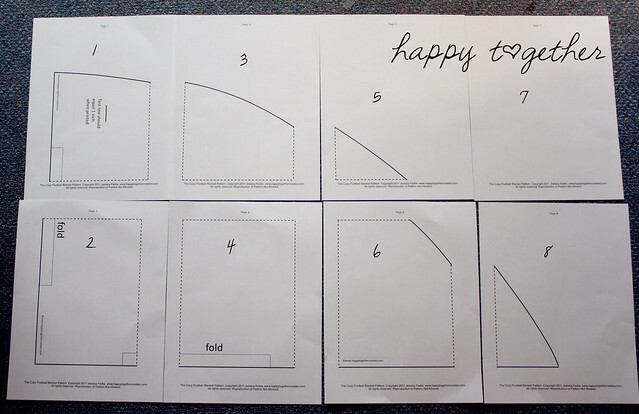 Then fold in twice like I do in the tutorial and cut the same type of angle on the open sides. You could always cut it a little open it and check it, then cut some more off until you like it. That is what I did. Then for the white part (lace) you could just buy some fleece from a fabric store. 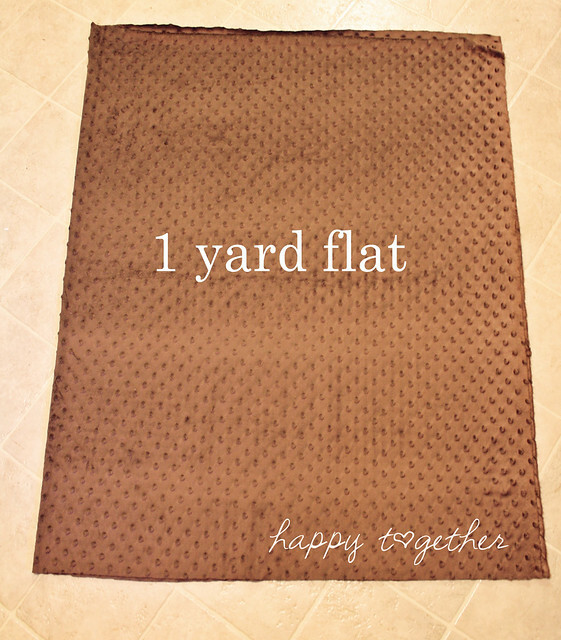 Just measure how long you want it for the longest part and buy the yardage at that length. I hope this helps some 🙂 Let me know if you make one. I would love to see how it comes out! I just finished making one for a baby shower I am going to tomorrow. I used a brown flannel and a blue plaid flannel. Thank you so much! It turned out really cute. LOVE this! I’m having a new grandbaby this month so I’m making it for him with the parents’ favorite team in flannel on the underside of the blanket. Cute idea! Thanks for sharing! I love this!! I searched forever for it after finding a picture of it on pinterest but once I found it the site wouldnt’ let me pin any of the pictures!! Thanks SO much for the pattern! I will definitely be making this for baby boy! So do you think that if we are doing for an older child, teen, adult just keep adding a yard each time we go up a “size”?? Hmmm you could try that. At a certain point though, if you are using regular 45″ wide fabric, it will get more of stretched out football look. So, if making for an adult, maybe try to find 60″ fabric if possible or some kind of already made large fleece blanket to use. But if making it bigger just for a child that would be a good thing to do. This is so cute Jess! 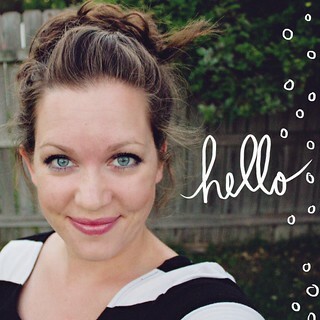 So thankful Kari pinned it so I could enjoy the adorable tutorial! Love it! I hope you will consider uploading a photo of this into SewSet, my latest endeavor. SewSet is a new on-line sewing pattern & tutorial search engine – where users can browse, search & find what they are looking for! And everything links directly back to your URL. Your creations are always so fabulous, and would be a great and welcome addition to the site! Thanks so much for sharing, and I hope you have a great day! I would love to make this for my nephews for Christmas presents. Is the sewing advanced? I’m a beginner and wondering if I could tackle this project. Also, did you use a sewing machine or could you hand sew it? How sweet of you! I wouldn’t say the sewing is advanced, it’s just that the types of fabrics I used could be a pain to sew (especially for the first time!). But, you could always use plain old cotton fabric or make both sides from flannel fabric for an easier sew (then just add iron on adhesive to white flannel for the strips). I used a sewing machine, but you could hand sew it. It would just take a while 🙂 Or…you could try the iron on hem tape maybe? Wonderful Tutorial! My Husband is a big football fan so I will have to do this for our future boys. I love it! I just made this last night. It is my first time sewing all alone (last time was about 10 years ago with tdidn’t the help of my mom). My blanket did not turn out pretty…but it’s not bad! I just read about the iron on adhesive and I probably should have done that. I just have to do the final sewing around the edges….thank you for posting everything. 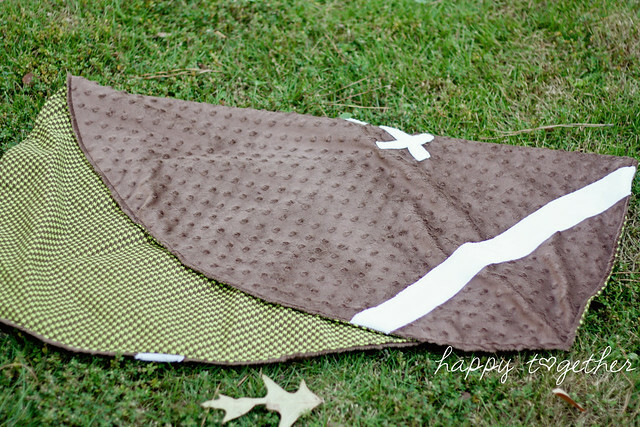 I created this blanket as a baby shower gift for a friend. It came out really well and the mom-to-be was thrilled. 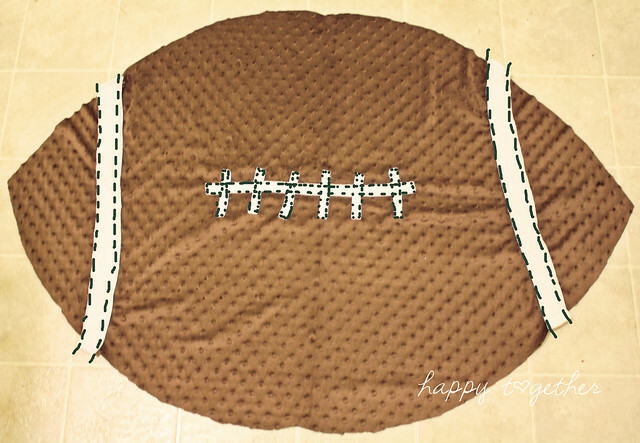 I blogged about it here (and linked back to this tutorial): http://boltsbobbinsblunders.wordpress.com/2013/01/21/a-football-blanket-doggy-bibs-sewing-baby-gifts/ Thanks! I made this blanket for my brother-in-law and his wife who are currently expecting their first & everyone loved it! I put the dad’s favorite college team’s fleece on the back to personalize it. I also made it slightly larger, added interfacing to stiffen it/add some weight, and used a flat shoelace type “rope” to do the laces which added a nice texture. Thanks so much for the great pattern! Off to make my second for our little lady! I love this idea! Your baby girl is so darling. Thank you for sharing. 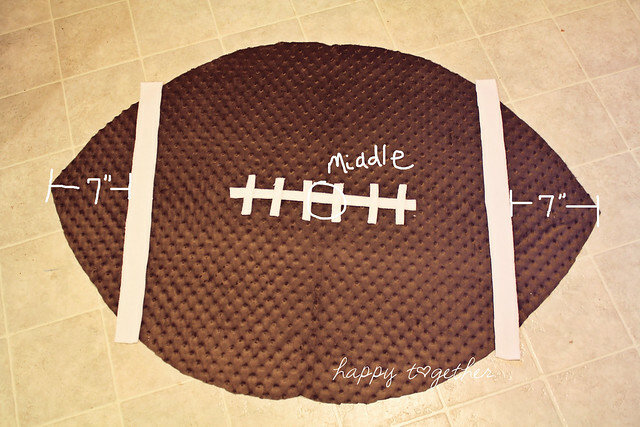 When I first saw this on Pinterest, I just knew it would be perfect for my nephew & his wife who were expecting, because he is on the coaching staff on a college team. Then I found out they were having a girl…but what the heck! I just used pink and brown polka dots on the backing! They love it! Since then, I have made one for my grandson with Patriots backing, and have cut one out for a close friend’s little guy. I am now printing out a 50% pattern to make a pillow for my grandson’s older brother to match his blanket! I hope it turns out great like the blankets have! Thank you so much for the pattern!! I made two of these blankets using Minky on one side and fleece and flannel on the other. They turned out super cute. Thanks for the tutorial. Is it safe to throw them in the washing machine? If I didn’t beforehand? Thank you for the free pattern! This is just an adorable idea! I’m about to go upstairs and make one for my sweet nephew who is due in September. Thanks for the awesome inspiration! Would you by any chance hace an idea on making a baseball blanket? i love the football idea which i plan to do for our little boy due in november but our friends having a boy as well and hes a football fan and shes a baseball fan and i know she would love it!! I love this! 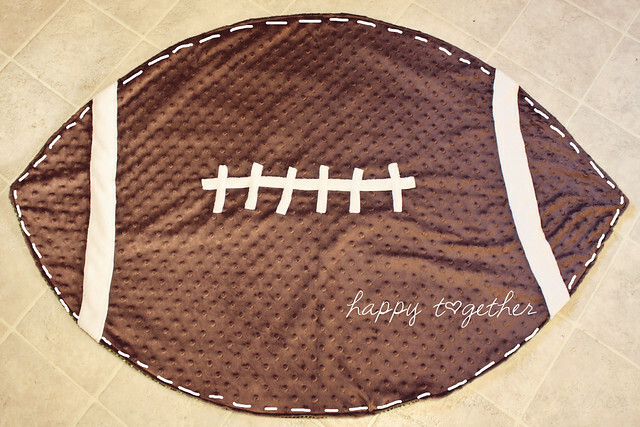 I would like to make one for my toddler grandson to use at the high school football games but want to make slightly larger…I have 1 1/2 yrds of fabric to work with…any tips on increasing the pattern to work with this size? Oh how fun! I would suggest just keeping it in an oval shape with more pointed ends. Maybe fold it half one way then fold in half the other way and cut it so the fabric fold that would be the middle of the football is where the point goes to? lol I hope that makes sense! Kind of like how I cut it here, but just making yours bigger. I am trying to print the pattern, and it is not fitting on the page. Any suggestions on how to get it to print right? I’m sorry you are having trouble with it :/ What program are you opening it in? It would be best if possible to open it in Adobe pdf reader probably. I know sometimes the automatic pdf on my computer messes up patterns so they don’t fit right or they don’t print the same size on each so it doesn’t match up. Send me an email at jessicafediw@yahoo.com if you have done this and it still doesn’t work. I can try sending you the pattern via email and see if that helps. Thank you so much for sharing this pattern. I made this for my grandson. It came out really cute. I sent you an email Linda, feel free to message me if you are still having any issues. I am also getting ready to reupload the pattern since this was posted a few years ago the file sharing was different. I just made this, the threads of the football were kinda a pain, but it turned out great!!! :):) THANK YOU SO MUCH! I love these blankets. I am anxious to make these blankets. Thank you for sharing . Wow! Thanks for the idea!!! After 7 yrs of fertility issues & the loss of a preemie son at 4 wks old, my daughter & son inlaw are soon expecting a healthy & big baby girl ! She will be dressed “Princess style” even when playing in dirt if I know my daughter! 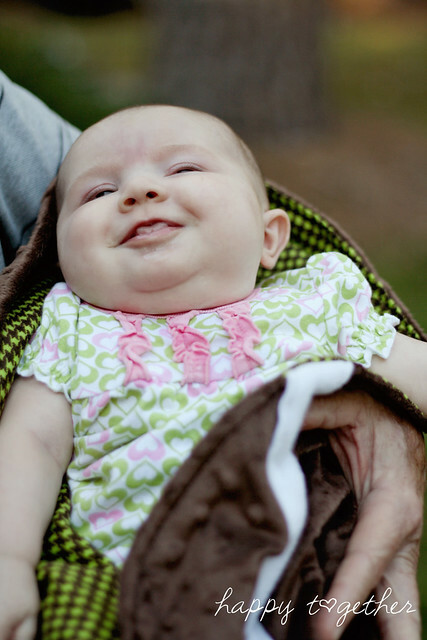 Have made several dear little baby dresses & my husband has given her a few baby camo outfits. I was looking for an idea for Dad. He is not a hunter, so the camo isn’t impressing Dad too much, but he is an avid football fan. 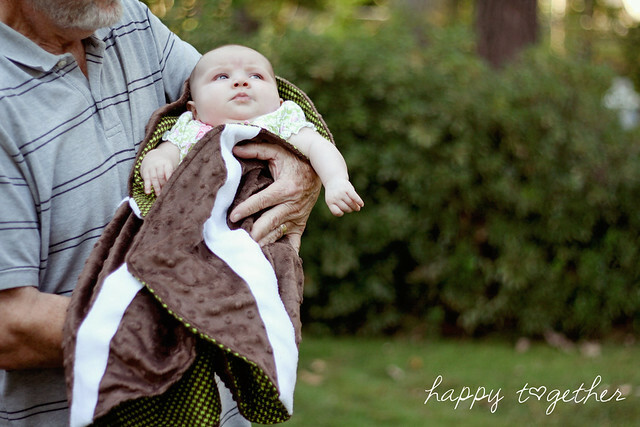 This blanket will be perfect for him!!! He & my daughter meet friends at a local non smoking pub to watch games & eat together. 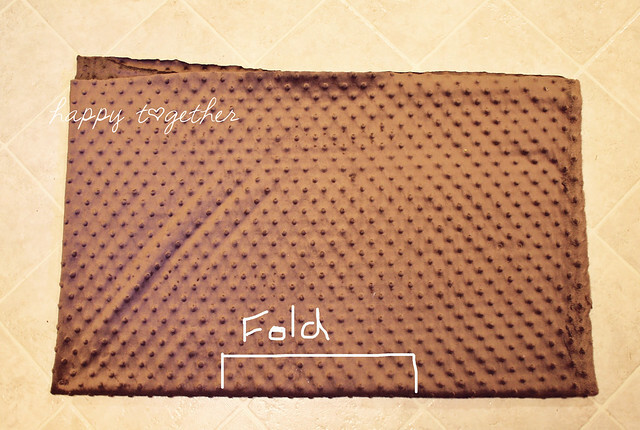 This blanket will be perfect!!! Now to decide if to make the inside team colors pastel to entertain my daughter or go full blast purple & black (Baltimore Ravens)? Either way, it will be loved!!! Thanks for the idea! I do have a question though….. Is the reason the pattern is in pieces so it fits most printer types? I have an oversized printer where I cut combine pieces making less seams. Do you think it will make any difference? Also, I was thinking of making the white stripes from soft felt. Do you see any problem with these ideas? Thanks again! Hi 🙂 How exciting!!! Congratulations to you and them! I do make my patterns to fit onto regular 8.5″ x 11″ pieces of paper so I have never tried them on an oversized printer. Let me know how that goes lol. And there is no problem at all with using different types of materials such as soft felt for the white part. Go for it! Thanks for the pattern. I made this and it turned out so cute. I used gross grain ribbon for the white part and flannel on the back. It really helped to use a washable fabric glue stick on the ribbon to hold it in place as I sewed it. What is the Total Deminsion of it once it is made? I have 3 Large Football Jerseys I would like to use on the other side of the Minky. This is actually being made a a Gift for a cousin for her son to be baby boy for a Memory Quilt from a Parent who has passed away. These 3 Jerseys are the ONLY 3 Items Left from the deceased parent 🙁 So I want to make sure I can fit them all or IF I need to make the quilt bigger. Also, what did you just use normal quilting batting and the quilting spray to keep it in place and keep it from moving around? 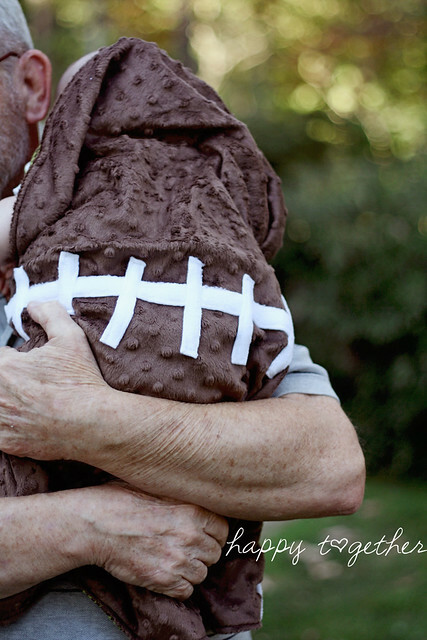 Any suggestions would be GREAT as this Grandparent LOVED Football. Do you have a pdf of this pattern so that I can download it and print it? Or did I miss it on the website? I couldn’t seem to find it. Did you tuck the fleece to give it a finished look on top, or just top stitch and leave it to look a little raw? Or did you zigzag stitch it? I’m trying to figure out the best way to sew the white on if I decide to use different fabric.